Removing a SourceBuffer with remove() releases all resources associated with the object. This includes destroying the all the segment data, track buffers, and decoders. The media element will also remove the appropriate tracks from audioTracks, videoTracks, & textTracks and fire the necessary change events. Playback may become degraded or stop if the currently selected VideoTrack or the only enabled AudioTracks are removed. // Adds another source buffer. SourceBufferList is a simple container object for SourceBuffer objects. It provides a read-only array accessor, fires events when the list is modified, and provides a way to remove SourceBuffer objects from the list. If buffer is null then throw an INVALID_ACCESS_ERR exception and abort these steps. If the list is empty then throw an INVALID_STATE_ERR exception and abort these steps. If buffer specifies an object that is not in this list then throw a NOT_FOUND_ERR exception and abort these steps. 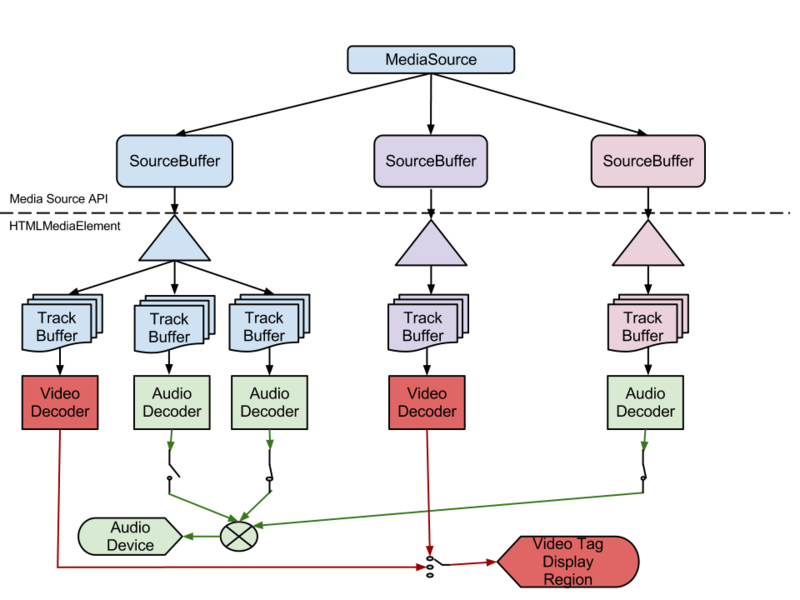 Remove track information from audioTracks, videoTracks, and textTracks for all tracks associated with buffer and fire a simple event named change on the modified lists. Destroy all resources for buffer. Remove buffer from the list and fire an removesourcebuffer event.